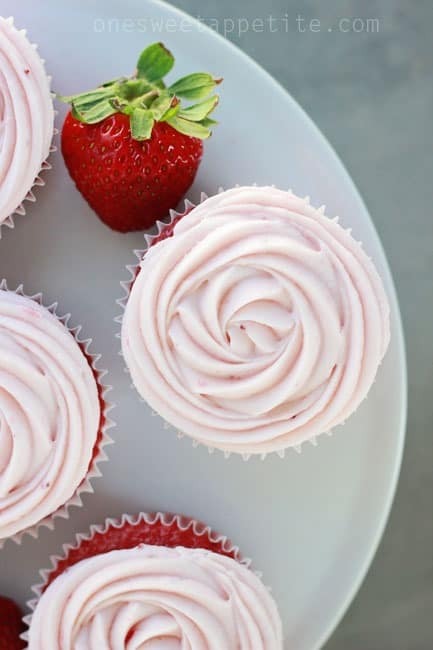 These Strawberry Cupcakes use a cake mix base with the addition of real fruit for an extra punch of flavor! They start with a white cake mix. I promise even from scratch bakers will fall in love with the bold flavor of this little cake. The addition of jello and fresh fruit really jazz things up and give these a wonderful strawberry taste! A cream cheese frosting (with the addition of more fruit) tops things off giving them the perfect finish! Doctored cake mix recipes are totally in. They are so simple to make and are almost fool proof. I have seen countless cookbooks and bloggers adding fun twists on the classics. This is mine. They puff perfectly and have a gorgeous red color. Top them with a simple strawberry cream cheese frosting and maybe a candied strawberry for presentation and you have yourself a gourmet style cake. Bring your ingredients to room temperature. This one seems silly, especially when you are using a cake mix, but is super important. Room temp ingredients help everything blend and combine together leaving you with a smooth batter ready for the oven. It is even more important with the frozen strawberries in this recipe. They need to be THAWED or your cupcakes will sink. Do not over mix the batter. The shortened reason why you should be careful? If you over mix you will have a dense cake. Use a cookie scoop. Using a scoop to get your batter into your liners ensures even cupcake sizes. Preheat your oven. I get pretty impatient and have been known to stick my cupcakes in the oven before it is ready. The result is almost always under or over baked cupcakes. Let your oven heat up to the right temperature before starting. Remove your cupcakes from the pan right away and cool completely before frosting. Your cupcakes will continue to bake as they sit in the hot pan. Pop them out onto a cooling rack. Also, avoid frosting until they are cooled completely. This will help your frosting stick and keep it from melting. Is the pink color perfect for spring? The leftovers filled our house with a wonderful berry smell and had me craving cupcakes for days after! Like this recipe? You will love my Peach Cupcakes with Cinnamon Frosting, Carrot Cake Cupcakes, and Red Velvet Cupcakes! 10 oz frozen strawberries, thawed and pureed in a blender. 1/4 cup reserved for the frosting. Place the first 7 ingredients into the bowl of an electric mixer. Blend on medium speed until smooth. Divide into you prepared cups filling 3/4 full. Bake for 15 minutes or until cooled. Frosting: Cream together the cream cheese, butter, and powdered sugar. Add the 1/4 cup pureed strawberries and mix until combined. Stir in the heavy cream a little at a time and whip until a thick consistency is formed. They are so pretty and I bet they tasted pretty wonderful! Love the frosting. Mmm… Pinning!! I’m not a huge cake lover, but cupcakes always sound and look more appetizing to me than cake does. 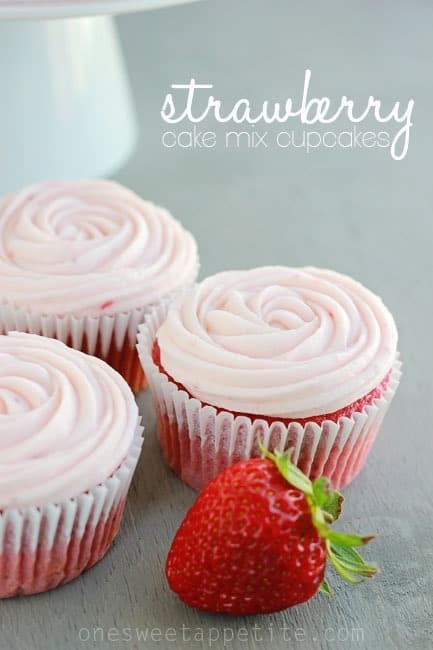 I love that this sounds easy enough because it starts with a cake mix, and adding real strawberries! Genius! And lets not get started on the frosting! 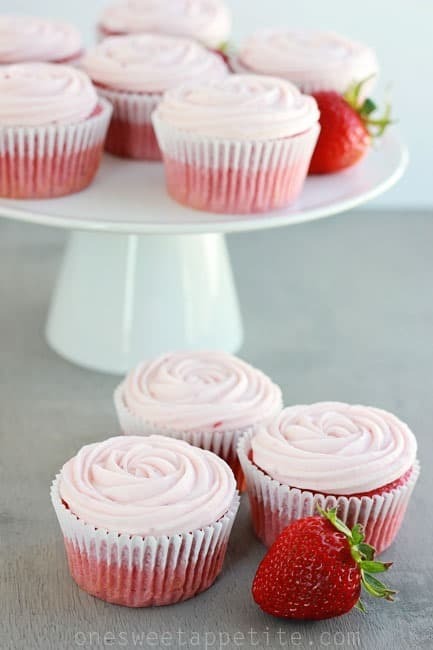 Strawberry Cream Cheese frosting. I would eat the whole bowl before it even got on the cupcakes. 🙂 Pinned! I start with cake mixes a lot especially when I’m making anything gluten free. It’s so much easier than buying all the different types of flour. These look delicious and I love the frosting. You doctor GF cake mixes successfully? Im always scared to because Im not sure what the difference in the flours will result in! I’m not super familiar with GF cake mixes so I’m not sure how it would turn out. I’m sorry I can’t help more! I love a good doctored cake mix. It makes me feel like I am making something awesome without having to spend too much time in the kitchen. thanks for the recipe. I will have to try it out sometime. I am definitely not above using cake mixes when the time is right and these look like the perfect use of a cake mix. YUM! Oh Jesseca these look so delicious! I just love strawberry cake and these look like something I could make – yum! I LOVE doctoring cake mixes. This one looks incredible! I always choose chocolate when it come to cupcakes, but I LOVE strawberries and cream cheese. I’m going to have to give these a try. Beautiful pictures too! Hi, I made these today exactly as the instructions specified, and for some reason when the cupcakes come out of the oven, they fell! I checked a couple of them with toothpicks, and they were definitely done, but sure enough they just sunk to the bottom. Any idea what could’ve caused this? They look delicious and I hope to try this recipe again! I’ve never had that problem. I’ll post this on my social media and see if any of my readers have any suggestions as to why they sank. Do you need the jello? I to am making these right now and so far 3 dozen have fallen in. I added a little flour to see if that would help so fingers crossed! That happens because the strawberry purée and the jello make the cake very moist, you get a denser cupcake vs when you use just the box mix there isn’t that extra heavy ingredient weighing it down so they puff up. Regardless people rave for this recipe every time I make it. Thank you for taking the time to comment, Brianne! I’m glad you’ve had success with this sweet flavor. Love the cupcakes … Just made them. Icing is delicious just need a little thicker consistency for the piping … Any suggestions ? You can put the frosting in the fridge for about 15 mins after it’s made.. place it in the bag to pipe and if it starts to soften (due to the heat of your hands), you can place the piping bag in the fridge for 10 mins or so to firm it back up. This is what has always worked for me when my cream cheese frostings seem a bit soft. What a smart tip! Thank you for sharing, Amy. Sugsr and Spice, I had the same problem! The cupcakes were amazing but the frosting was thin and messy when piping. The flavor of the frosting was spot on though! I would love to make them again with a thicker frosting. Suggestions? There are a couple things you can do to get a thicker consistency… You can reduce the amount of strawberry puree or add additional powdered sugar. Are you making sure you whip it well after you add the heavy cream? I’m going to make these today ! i was wondering how many cupcakes does this recipe make? 24 cupcakes. Maybe a few more depending on how full you fill your liners. Did you still follow the directions for the cupcakes off the box or just used the mix? Best strawberry cupcakes ever! Made a double batch of these for a co-worker’s baby shower and no one could eat just one! Made them for my granddaughter’s birthday and they came out PERFECT!!! it was a huge hit, and people couldn’t stop eating them. The icing was perfect as well. Definitely our” family recipe” now! 🙂 thank you so much for sharing! Want to make this today. Only have strawberry cake mix. Will it work? White cake mix is recommended over the strawberry flavored one. You start to get a more processed flavor if you substitute. Thanks for sharing this option of strawberry deliciousness. Can I substitute the white cake box mix for yellow cake box mix? I’m using the sugar free cake mix for a more diabetic friendly option (I like cake too lol) and unfortunately it’s only limited to yellow and chocolate. Makin these right now at midnight for my daughter’s fifth birthday and they are sinking terribly. So upset. Should’ve just left the box mix alone and made it as-is. Ugh!!! I’m sorry they didn’t work out for you. I have made these several times over the years and haven’t ran into this problem. However, after a quick internet search I cam across this post that might be able to help you out next time. Hi Jesseca, thanks for sharing this delicious recipe. Since it’s nearly Valentine’s Day, I wanted to make a pretty pink cupcake for my daughter to take to her Girl Scout’s meeting. I found this recipe and followed it to the letter. They turned out perfect and were delicious! Thanks for a great recipe. I agree! Isn’t that icing divine?! Do not follow the instructions on the box. Use only the directions in the post. This recipe looks delicious & it will be perfect addition to my daughter’s Hello Kitty party this weekend! My only question is the extra liquid from the frozen strawberries once thawed. Do I drain the access liquid before pureeing, or puree the liquid with the strawberries into the batter? I’ve made the icing several times without fail. Maybe you didn’t beat it long enough? I think that’s the purpose of the 2 tablespoons of heavy whipping cream. It makes it thicker and holds together nicely when piped onto the cupcakes. 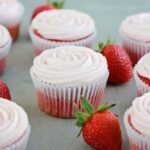 I have made this recipe several times, and it’s the best strawberry cake/cupcake I’ve ever had! Everyone who has eaten these have loved them! Also, I have not had any of the problems with them that others have posted. They are exceptional, and I thank you for pinning them! I have never tried to make it without the jello, but don’t see why it wouldn’t work. Let us know if you try it out! I am making these for work and I could not find instant strawberry jello anywhere!!! Has anyone tried it with the regular cook and cool jello and if so did they turn out okay? Does it need to be instant or cook and serve jello? Instant jello. I’m not positive, but I don’t believe they have a cook and serve strawberry jello. Going to make for my hubby’s birthday but I can’t eat cream cheese. Wondering if I could substitute frosting for regular vanilla? Can I use fresh strawberries instead of frozen? I don’t see why you wouldn’t be able to. Mine also fell. I followed the link that you posted and I’ve never had an issue with my oven temp being off. I haven’t made the frosting yet…I’m hoping it works and I can fill in the ‘divits’ with frosting! Does anyone know how much longer I should bake this recipe if I’m doing it as a cake instead of cupcakes, like the directions show? I’d check it at 30 minutes and go from there. I’ve never made it as a cake before so I’m not sure how long it would need. Can I first just say THANK YOU for sharing this recipe!!! I have been baking, and baking, and baking and haven’t found a strawberry cupcake recipe yet that I liked until this one!!! All the others either baked away from the liners or weren’t strawberry enough. This one. THIS ONE was PERFECT! Mounds of pure perfection! The cupcakes didn’t sink and oozed of strawberry flavor. Hats off too ya, my dear!!! What brand of jello did you use? I used the Jell-O brand. Could I use fresh strawberries and is the jello powder regular or the strawberry creme one? Thanks! I’ve never used fresh strawberries but I’m assuming that you could. And we’ve tried both jell-o’s and prefer the regular. These look delicious!!! Was looking at the frosting ingredients and saw the 6 cups of powdered sugar. Is that a typo?? No it’s not. I used 4 cups because that’s all I had so I did and my frosting wasn’t as thick so I’m guessing if you put 6 cups it would make it thicker. But then when I put 4 cups it was already really sweet so it’s up to you. Already sweet and watery or Very sweet and thick. I really enjoyed making these for someone’s bridal shower. Huge success! Made little tweeks and went with a buttercream icing. I am trying these again and making lemonade icing next time. Thank you! Do you use frozen strawberries with or without sugar to make your purée? I’ve used both and prefer the ones without. Sometimes it’s hard to find though. 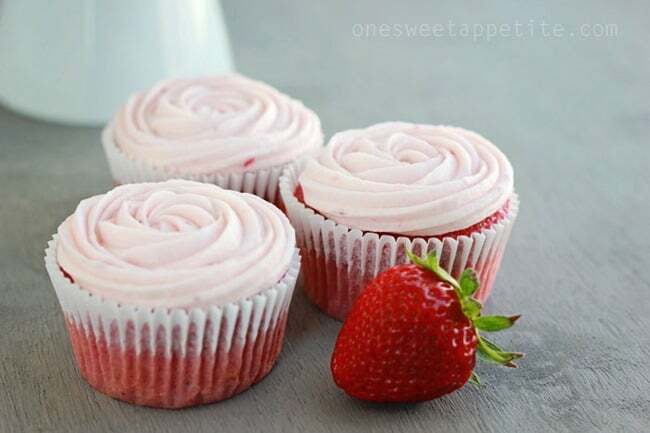 Make sure the strawberries are thawed completely or your cupcakes will sink. I want to make these, but only have yellow cake mix on hand. Does it change the flavor at all? Btw, these look amazing and I cannot wait to try it. I have never actually tried to make them with yellow cake mix. It might alter the flavor a bit so I’m not sure how they will taste. White cake mix is better because white cake mix doesn’t have any flavor. Hello! I am about to tackle this recipe and realized I don’t have he heavy cream for the frosting. What can I substitute? Google wasn’t very helpful. Thank you! You can try milk but the end result might be slightly different. This recipe looks amazing! Would I be able to make this as mini cupcakes? If so should I make any adjustments with ingredients or cook time/temp? Yes! We’ve made it a few times in mini cupcake form. I’d just check them around 8-10 minutes and if a toothpick comes out clean you are all set! I wonder if some of these ladies whose cupcakes fell used strawberries in juice rather than individually frozen strawberries. That’s a great observation. Maybe something for everyone to consider before starting! Thanks Margaret. I wondered myself and haven’t actually tried this recipe yet. Saturday for a Sunday wedding! I’ll let you know. I did get the individual berries. Can this recipe be used as a cake? Thanks!! Can you use real strawberries in place of the frozen? I’ve actually never tried. I know that the juices do add to the flavor. I see people asking about removing the Jello. Did it work without jello? Also, do you make the actual Jell-O and then put it in or is it straight Jell-O powder into the mixing bowl? Do you know how much purée 15 oz of strawberries makes? I already have the purée left over from making jam so I’m not starting with a frozen amount that can be measured in ounces. I just wanted you to know that back in 2015 I ran across your recipe and have loved it since then! I have made your strawberry cupcake recipe at least 7 times. For anniversaries I use red hots on frosted cupcakes and write out each letter of Happy and the years of marriage.Everyone loves them! These were pretty bad. It started out with lumpy batter, tried to get it smooth with my Kitchen Aid but it didn’t work. Still tried to bake them. They looked beautiful while baking but as soon as I pulled them out of the oven after 15 minutes they completely sank. I tasted them anyway and the taste was weird and gummy. A total waste of money, unfortunately. Never got back after the wedding last August! We made 5 different kinds of cupcakes where all but one started with boxed cake mixes and got dressed up. The strawberry cupcakes were absolutely delicious. They might have settled just a bit but the consistency was still more than agreeable. The favs of the day was a chocolate cupcake with salted caramel frosting. We also did carrot cake with cream cheese, ( that was from scratch), vegan pumpkin with chocolate frosting, white gluten free with lemon frosting, and the strawberry, which was the brides favorite. It was a great success. My niece and I made these for a party she was having and the cupcakes turned out so moist and full of flavor. The icing was delicious and matched perfect with the cupcakes. Yum!! I’m so glad to hear you loved them, Kerri! They are one of our favorites. These look delicious! I accidentally bought strawberry box cake mix instead of white. Do you think it will still work and be ok? Or too much strawberry? Thanks! Great question. I’m not sure that it will have the exact same flavor but don’t see a reason it wouldn’t work. Do you think I could make these ahead and freeze them? With or without the icing? Anyone tried? Yes. I made these for a wedding without the icing and froze them in freezer safe bags. I let them come to room temperature and frosted them with no problems. Hi! I just came about this recipe and can’t wait to try it. The only thing is that I have fresh strawberries instead of frozen. Would it make any difference in the recipe? Thanks! I am getting ready to try this recipe. I have 2 white cake mixes that are different brands. (Both name brand.) One is 15.25 oz. and the other is 16.25 oz. I am wondering if that may be the issue with cupcakes falling? Would I use the 16.25 oz mix? 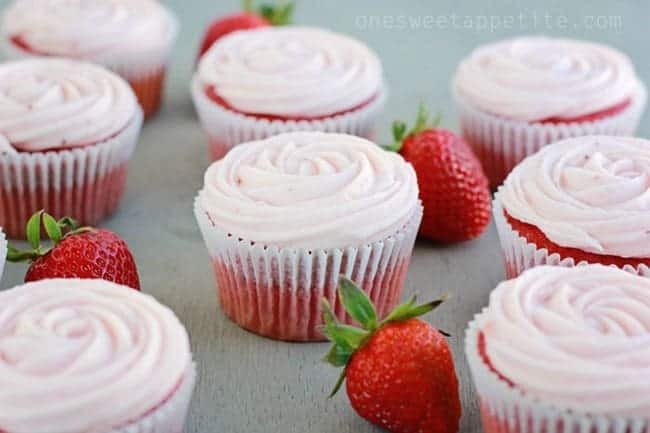 I am making these for a graduation party this weekend but want to make sure I have it right before I bake tons of them later this week….Thanks! 16.25 oz is the size I use. Thanks for pointing out the different sizes, Kim. I’ll add that to the recipe notes. Just an update… I’ve been making your recipe for several years now, and these cupcakes are still a hit, both at home and everywhere I take them!! I did have a slight problem with sinking in the middle, but I corrected it by baking the cupcakes a little longer. Other than that, they are perfect in every way!! They bring back memories of my mother’s strawberry cake she used to make for Valentines Day in the heart-shaped pans. The icing didn’t stay on the cake very well, but oh my, it was good! These are better, I think!! I’m sorry you had trouble with the recipe. I would love to help troubleshoot and figure out what went wrong. We made these cupcakes for a Halloween party this weekend and they were a hit! I made sure that I used frozen berries that thawed completely and also added a few minutes to the baking time as suggested by a different comment. I’m glad you love them as much as we do! Thanks for taking the time to rate my recipe, Stacy! Does this recipe call for 2 boxes of cake mix? I’m not sure if that’s what the 1 box 1 box means? Making today so help! Good catch. Just one box of cake mix. It looks like I accidentally typed it twice. For the strawberries, did you use whole unsweetened frozen or the kind that are sugared and frozen? I’ve used both but prefer the unsweetened. One more question. What size cake mix did you use? Recipe are so hard now that the cake mix size has changed! Thanks so much. A 15.25 oz box. I’ll add that to the recipe. Great call out, thanks!